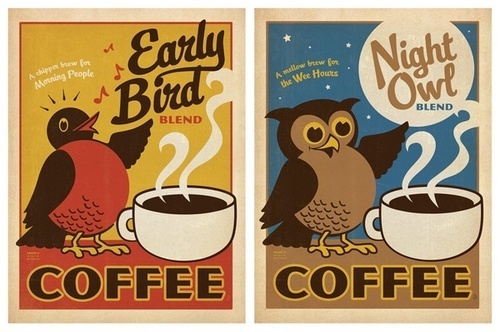 "You may colloquially know these two types of people as 'morning larks' and 'night owls', respectively. Unlike morning larks, night owls are frequently incapable of falling asleep early at night, no matter how hard they try. It is only in the early-morning hours that owls can drift off. Having not fallen asleep until late, owls of course strongly dislike waking up early. They are unable to function well at this time, one cause of which is that, despite being 'awake', their brain remains in a more sleep-like state throughout the early morning. This is especially true of a region called the prefrontal cortex, which sits above the eyes, and can be thought of as the head office of the brain. The prefrontal cortex controls high-level thought and logical reasoning, and helps keep our emotions in check. When a night owl is forced to wake up too early, their prefrontal cortex remains in a disabled, 'offline' state. Like a cold engine after an early-morning start, it takes a long time before it warms up to operating temperature, and before that will not function efficiently. "An adult's owlness or larkness, also known as their chronotype, is strongly determined by genetics. If you are a night owl, it's likely that one (or both) of your parents is a night owl. Sadly, society treats night owls rather unfairly on two counts. First is the label of being lazy, based on a night owl's wont to wake up later in the day, due to the fact that they did not fall asleep until the early-morning hours. Oth­ers (usually morning larks) will chastise night owls on the erroneous assumption that such preferences are a choice, and if they were not so slovenly, they could easily wake up early. However, night owls are not owls by choice. They are bound to a delayed schedule by unavoidable DNA hardwiring. It is not their conscious fault, but rather their genetic fate. "In this regard, a societal change is needed, offering accommodations not dissimilar to those we make for other physically determined differences (e.g., sight impaired). We require more supple work schedules that better adapt to all chronotypes, and not just one in its extreme. "You may be wondering why Mother Nature would program this variability across people. As a social species, should we not all be syn­chronized and therefore awake at the same time to promote maximal human interactions? Perhaps not. As we'll discover later in this book. humans likely evolved to co-sleep as families or even whole tribes, not alone or as couples. Appreciating this evolutionary context, the benefits of such genetically programmed variation in sleep/wake timing preferences can be understood. The night owls in the group would not be going to sleep until one or two a.m., and not waking until nine or ten a.m. The morning larks, on the other hand, would have retired for the night at nine p.m. and woken at five a.m. Conse­quently, the group as a whole is only collectively vulnerable (i.e., every person asleep) for just four rather than eight hours, despite everyone still getting the chance for eight hours of sleep. That's potentially a 50 percent increase in survival fitness."